At the weekend, the wonderful “all things sheep and goats” christmas market popped up on Østerbro in Copenhagen. The market is run annually by Sjællands Fåreavlere, the sheep farming association for this region of Denmark. It brings together crafters, farmers, knitters and spinners from the area and it’s basically yarn lover’s heaven. 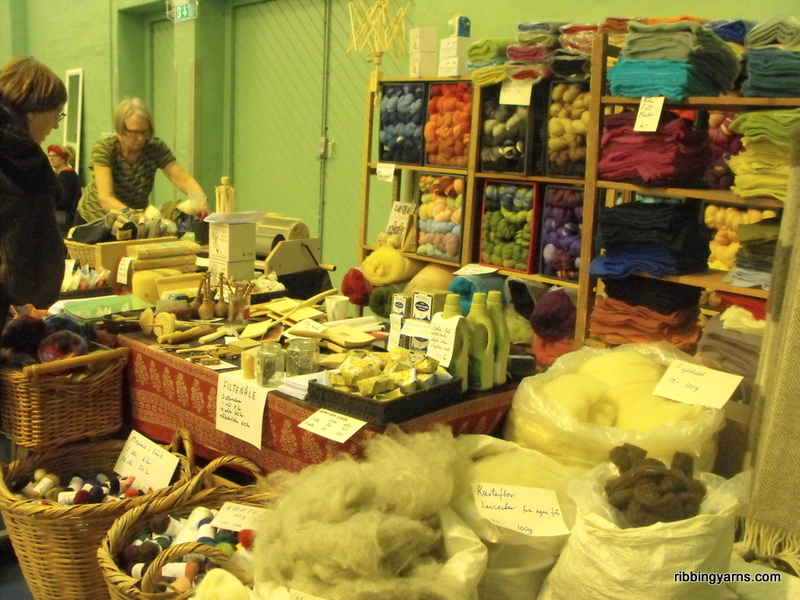 Vævestuen’s stall with the lovely natural fibres! First stop was the stall run by Vævestuen, in hopes of some locally produced spinning fibre. I get most of my fibre from the UK, and as yet I havn’t come across much from Denmark, but I got a nice surprise! As well as a wadge of cloudy grey Gotland fleece which I’d fancied having a go with, they were also selling carded fibre from their own Leicester flock. Even better, it was washed lightly, retaining some of it’s natural lanolin for spinning “in the grease”- something I also wanted to try. Wandering around while trying to compact wadges of fibre under my arm, I came across a stall selling gorgeous mohair goat skin blankets from a local flock, and I went over to have a look (and of course, a feel). No mohair fibre to be seen, but I got chatting to Karin from Texilgården, who asked if I was a spinner and told me she sells mohair, wool and angora fibres from her own flocks (and whatever “flock” is for rabbits- I can’t remember!). I was invited to come over and meet the animals, so I’m looking forward to that :) Completely unrelated to goats, I spotted a basket of silk fibre in the corner too (something else on my spinning wish list)- and bought a small amount to experiment blending with wool. 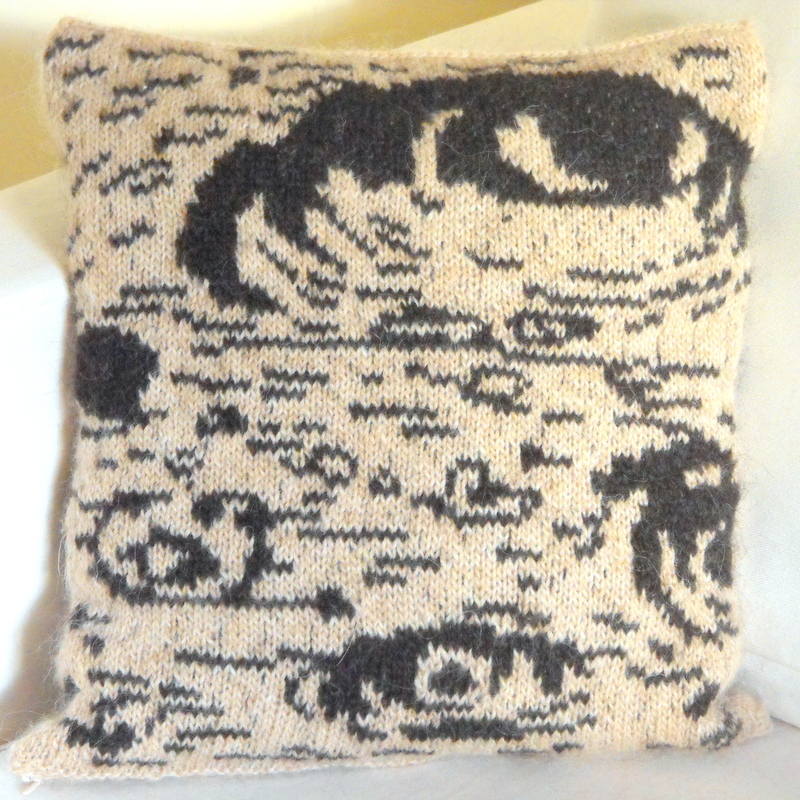 This entry was posted in Events and tagged christmas market, Copenhagen, Craft, Craft Market, Danish, farmers market, Garn, Handmade, Håndarbejde, julemarked, København, mohair, natural wool, plant dyed yarn, sjælland, sjællandske fåreavlere, Spinning, textilgården, vævestuen, Wool. Bookmark the permalink. Looks wonderful. Felt bird houses – adorable! – but surely elves live in them?